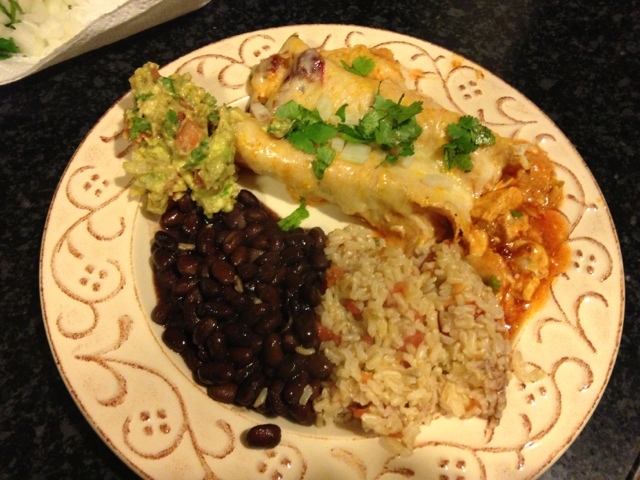 As promised, I am finally bestowing y'all with my Chicken Enchilada recipe. My original inspiration came from here, but I have since tweaked them to my liking...aka SPICY. These are definitely spicier than your average chicken enchilada so if you prefer milder food I suggest leaving the chipotle peppers out. However, they are the secret not any longer ingredient that sets these cheesy delicacies apart from your average Tex-Mex. 2. Shred Chicken and place in large bowl. 3. Drain chipotle peppers (there is a lot of extra adobo sauce in that can) and then dice. Add to bowl of chicken. 4. 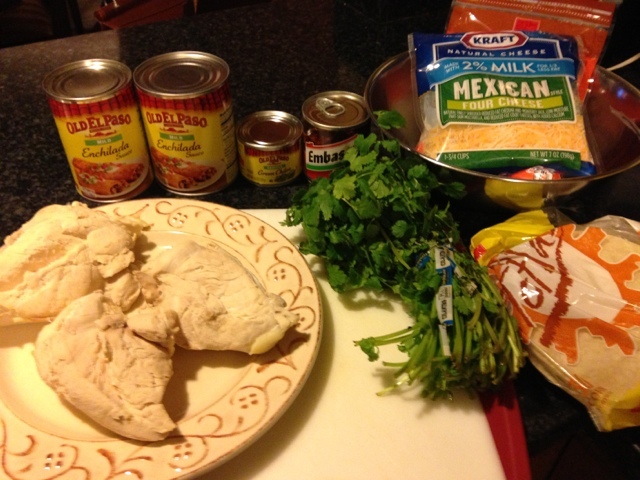 Add Diced Green Chilies to bowl as well as a good handful of chopped cilantro and 1/4 cup of enchilada sauce. 5. Add one cup of cheese and mix well. 6. In a baking dish add about 1/2 cup of enchilada sauce in bottom of dish. 7. Wrap tortillas in a damp paper towel and microwave for about 30 seconds. Just until softened. 8. 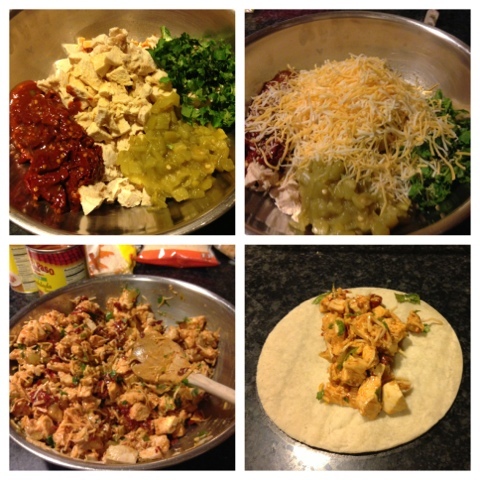 Take one tortilla at a time and fill with about 1/3 cup of chicken mixture. 9. Roll enchilada and place seam down in baking dish. 10. Continue until dish is full and you have ran out of mixture. 11. 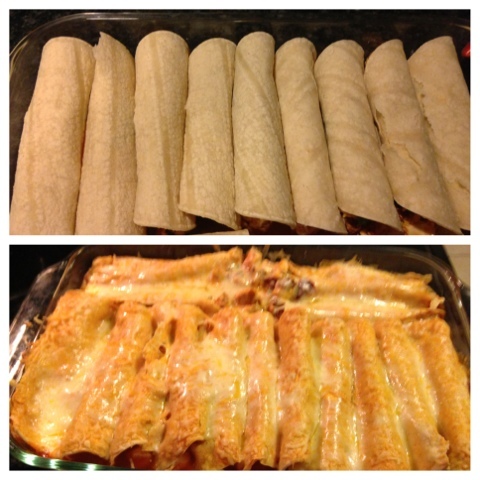 Cover enchiladas in remaining enchilada sauce. 12. Then top with remaining cheese. 13. Make a foil tent and bake for about 10 minutes. 14. Remove tent and bake for an additional 10 minutes. 15. Remove and let sit for 5 minutes. Serve with cilantro or onion and enjoy! This is honestly one of the easiest recipes, and it tastes like you have been laboring away in the kitchen. The chipotle peppers give it an excellent kick and who doesn't love something covered in cheese! Also other than the cheese these are relatively low in fat and pretty healthy. Perfect for a splurge night when you still want to feel good about what you have eaten.